SCVHistory.com LW3430 | William S. Hart | Hart and Fritz, Horseshoe Ranch, Newhall, Publicity Photo ~1920s. 8x10-inch photo cut to 6½x9¾ inches; serial number at lower left has been blotted out on the original print from which this copy print was made. Photo editor's enhancements are also evident on Fritz's left foreleg; the enhancements are on the original print. 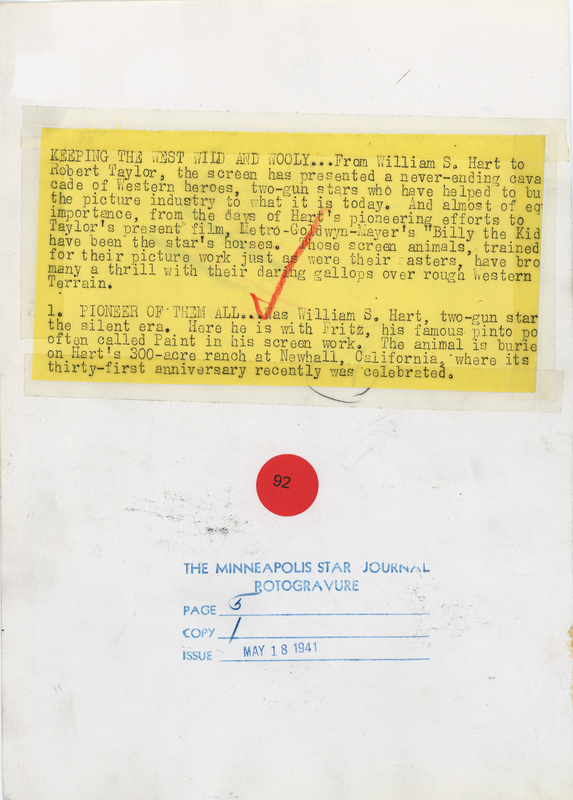 This copy print is from the Minneapolis Star Journal archive. From William S. Hart to Robert Taylor, the screen ahs presented a never-ending cavalcade of Western heroes, two-gun stars who have helped to build the picture industry to what it is today. And almostd of equal importance, from the days of Hart's pioneering efforts to Taylor's present film, Metro-Goldwyn-Mayer's "Billy the Kid," have been the star's horses. Those screen animals, trained for their picture work just as were their masters, have brought many a thrill with their daring gallops over rough Western terrain. 1. 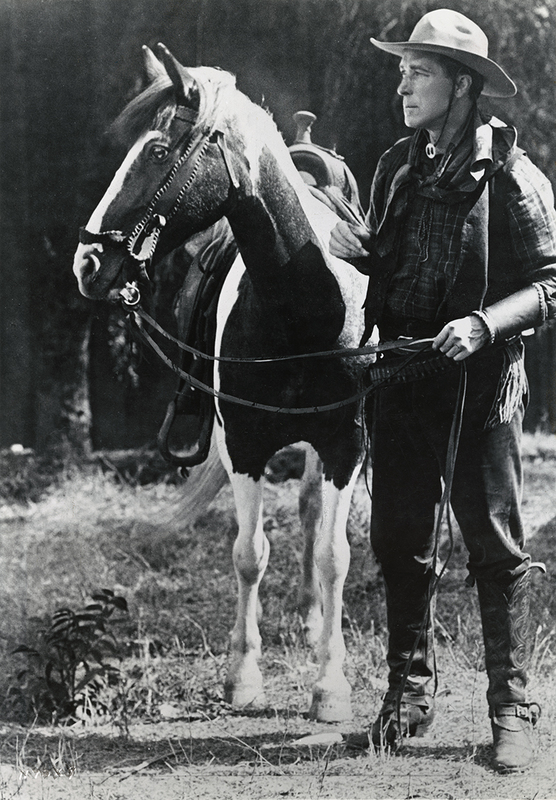 PIONEER OF THEM ALL... was William S. Hart, two-gun star of the silent era. Here he is with Fritz, his famous pinto pony, often called Paint in his screen work. The animal is buried on Hart's 300-acre ranch at Newhall, California, where its thirty-first anniversary recently was celebrated. The ranch is said to date to 1910 when its owner was George Babcock Smith. LW3430: 9600 dpi jpeg from original photograph purchased 2017 or 2018 by Leon Worden.